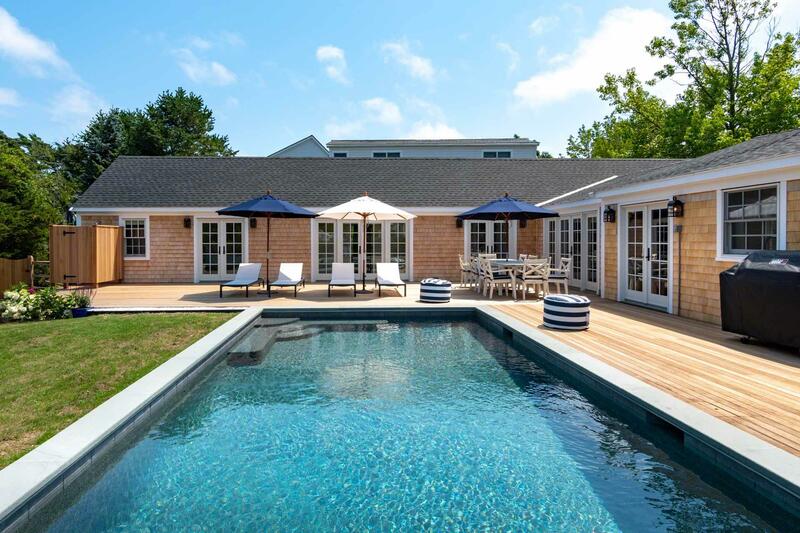 Point B Exclusive - NEW FOR SUMMER 2019 - This luxurious home with pool has just been completely renovated and transformed by noted architect Patrick Ahearn. The single floor design features nicely integrated indoor-outdoor lifestyle and flow, with numerous French doors opening out to pool and patio area. New pictures added as available. The indoor living space has a modern layout with open Living, Dining, and Kitchen Areas. The Living Area is centered around a fireplace with media center and built-ins. It opens to the Dining Area and Kitchen. In addition to the dining table, there is also a lounge area with sofa in the Dining Area. The fully-equipped Gourmet Kitchen has a center prep island/breakfast bar, casual dining area, and quartz counters. French doors from the Kitchen and Living Area open out to the patio and pool for outdoor entertaining. The Master Bedroom is at the end of one wing of the house. It has a walk-in closet plus deluxe Master Bath with double vanity and glass walk-in shower. French doors open to the pool and patio, and nearby outdoor shower. Two of the four other Bedrooms share a Jack and Jill bathroom, while the other two Bedrooms sit at the opposite end of the house and share a full bathroom. The house will feature a coastal color palette throughout, with white slip covered furniture. 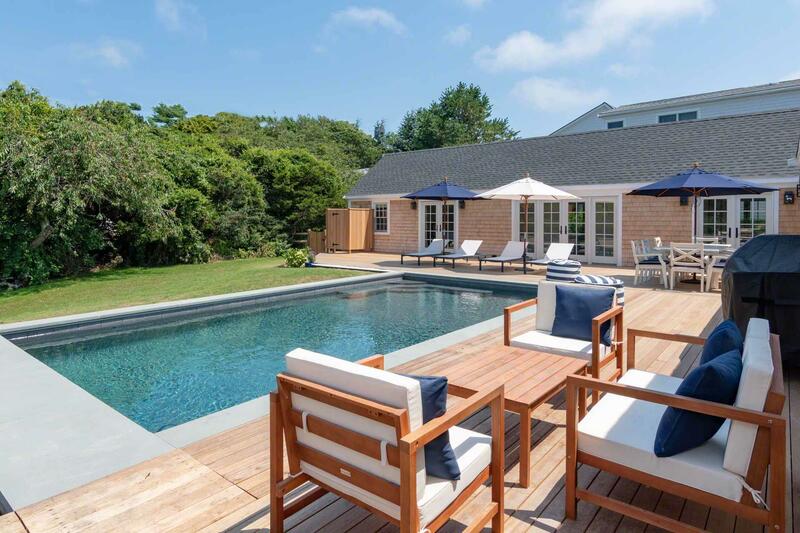 The outdoor living centers around a heated 16 by 32-foot saltwater, gunite pool. It is wrapped on two sides by a large stone patio and pergola, with areas for lounging, sunning, and dining. There is also a private yard area, and the grounds will be professionally landscaped with privet hedge, hydrangeas, and rhododendrons. With its convenient in-town location, the bike path is nearby, and downtown, with its restaurants, shops, and harbor, is a 5 or 10 minute bike ride. NOTE: The pool is heated to 81 degrees and included in the rest for July and August. There is a weekly surcharge of $250/week in June and September, and a $350/week surcharge in May and October.